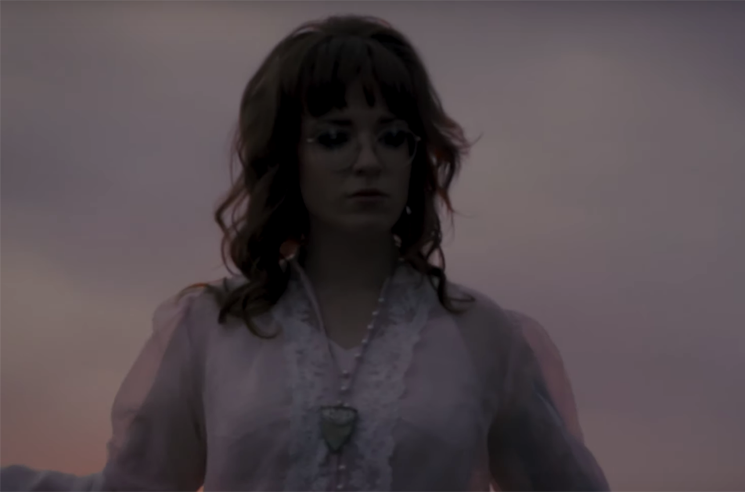 Megan Nash's album Seeker is up for Contemporary Roots Album of the Year at the Junos this weekend, and ahead of the huge Canadian awards show, she's unveiled the music video for the LP's title track. The video was shot on Treaty 4 Territory in southern Saskatchewan, with the performance footage captured in the Moose Jaw Museum and Art Gallery Theatre. "I wrote the song 'Seeker' about different experiences in my life that lead me to feel a connection with something larger than myself," Nash tells Exclaim! "It's about spirituality, pints of beer, falling in love and clear prairie nights. It's about getting lost in your creative process, losing track of time and waking up from that experience to find a new song." She adds, "This video for me is about the push and pull one can feel between our ego and our self throughout the creative process." That comes through in the clip, which sees Nash splitting time between dancing outdoors, playing guitar against a blank grey backdrop and surrounded by a circle of papers and candles and crystals. Watch the video for "Seeker" below. Nash will perform as part of JUNOFest on Friday (March 15), prior to the big ceremony on Sunday (March 17). You can see her other upcoming live shows listed below, as well.